It is well known that I am a generally critical of the public service in respect of a systematic (and cultural?) tendency to under-perform. Just by empirical day-to-day evidence (ask anyone who has dealings with the service…) my conclusion long ago its efficiency/productivity AVERAGES about 20%. What is almost never remembered is that I have ALSO STRESSED that there are some OUTSTANDING public servants who sometimes go BEYOND the call of duty. Unfortunately, they are too few! Fortunately, some of those conscious can be found at the Dominica Social Security (and in large numbers) and, incidentally, found ALSO at all levels in the DDA and within DASPA…). 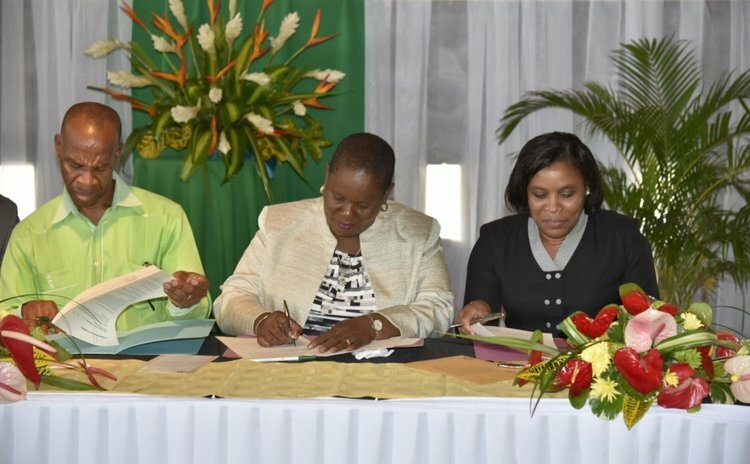 It was at last Monday's launching of the National Health Insurance Pilot Programme (NHI) that Prime Minister Roosevelt Skerrit applauded the efforts of those particular public officers working at Dominica Social Security, the Ministries of Health and of Finance, and at the CBI unit in rolling out this Pilot Programme (NHI) in a restively expeditious manner. Maybe it got priority treatment because of the great need; reflecting yet again government's emphasis in helping "those most in need". As announced close to a year ago in the PM's Budget Address last year, it is principally designed to provide assistance to mothers aged 35 or younger with children aged three years or younger who are in need of financial aid for critical medical complications. It is perhaps again because of that urgency that the Prime Minister, ever a practical man, decided not to wait on funding by a special financial calculus at the DSS itself, but to utilize the available resources of the CBI. But back on the subject of laudable productivity, one should not be surprised at the words of commendation towards the DSS. Less than a year ago the government had to turn to that institution to ensure an ORGANIZED and SYTEMATIC cheque-payment structure to facilitate the monthly allowances to the Petite Savanne ERIKA victims and to those providing replacement housing. Almost EVERYONE who deals with the DSS seems to be very satisfied with their standard operations in their many specialized departments. They are a GOOD example that many other statutory corporations (and, of course, government ministries generally) could learn from! And, for Dominica to REBUILD BETTER, need to! One way to get the ball rolling is to follow the advice of the IMF, stated just last month "…better target education programmes in order to improve labour productivity…" Interestingly the IMF Report for St. Lucia issued one week later was even MORE to the point, referring to BOTH the private and public sectors. On a positive note, I end with this remark of Mr. Skerrit: "We all speak loudly about our disappointments and dissatisfactions from time to time, but on this occasion, I think we need to ask the public officers involved to take a salute, for their timely delivery of this programme. It is the end-product of true team spirit and team workmanship."